Harry Noller, the Sinsheimer Professor of Molecular Biology, and his coauthors on a groundbreaking paper published last year have received a major award in recognition of their achievements. The American Association for the Advancement of Science (AAAS) has awarded them the Newcomb Cleveland Prize, which is given annually to the authors of an outstanding paper published in the association's journal Science. 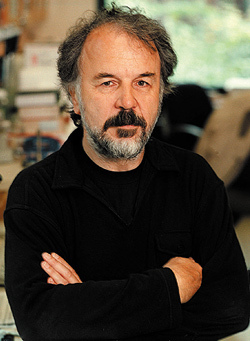 In addition to Noller, who directs the Center for Molecular Biology of RNA, the authors included Marat Yusupov and Gulnara Yusupova, a husband-and-wife team who were visiting researchers in Noller's lab and are now at the Institute of Genetics and Molecular and Cellular Biology in Strasbourg, France. The other coauthors and corecipients of the prize are Albion Baucom, a computer specialist in the RNA Center; postdoctoral researcher Kate Lieberman; Thomas Earnest at Lawrence Berkeley National Laboratory; and Jamie Cate, now a faculty member at UC Berkeley and formerly a postdoctoral fellow in Noller's lab.